In the course of researching for Notorious Vow, I’ve been fortunate to have been able to draw upon travels across Britain while attending school and on vacation. Palaces of the nobility from the Georgian and Regency periods by and large no longer exist in the great capital, so the few that remain and can be seen in person are very helpful in any endeavor that investigates this era. 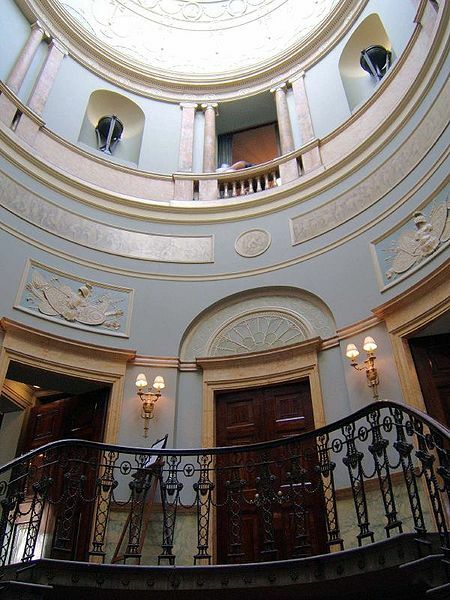 The Adams staircase at Home House was my inspiration for the great central interior feature of Northam House. The remarkable Georgian mansion that is Home House remains today in the form of a private club. It is a constant source of melancholy for me that so many of these mansions were raized after the Blitz, or because of taxation and development. This entry was posted in Notorious Vow, Regency and tagged Northam House Home House Adams Staircase by Angelyn. Bookmark the permalink. Loved the staircase! It is a shame these lovely houses aren’t around anymore. Thanks for the compliment! Did you see Downton Abbey last night? It was filmed at Highclere castle, an English countryhouse whose construction would have dismayed Russell and Vivien’s generation. The Victorian facade was placed over the classical manor that had existed since the seventeenth century. The classic lines of the Palladian manor would have been much more to my characters’ taste than the neo-Gothic (also called High Elizabethan) towers which themselves were modelled after the Parliament buildings in Westminster. I hate the thought that these great old house were lost forever to “progress”. I think that’s one of the biggest reasons I’m drawn to this period of history. In less than two hundred years, massive buildings just vanished, often carrying with them priceless craftsmanship (carvings, plasterwork, etc.) A poignant website on the virtual reconstruction of Scotland’s massive Hamilton Palace at http://hamilton.rcahms.gov.uk/rediscover.html is fascinating to look at. Incredibly, the great palace became unstable because of coal mining underneath and had to be demolished. Parts of the interiors were sold intact at auction in London and some of the contents were purchased by American tycoon Henry Clay Frick (1849 – 1919), a character in another novel of mine about the Johnstown Flood.